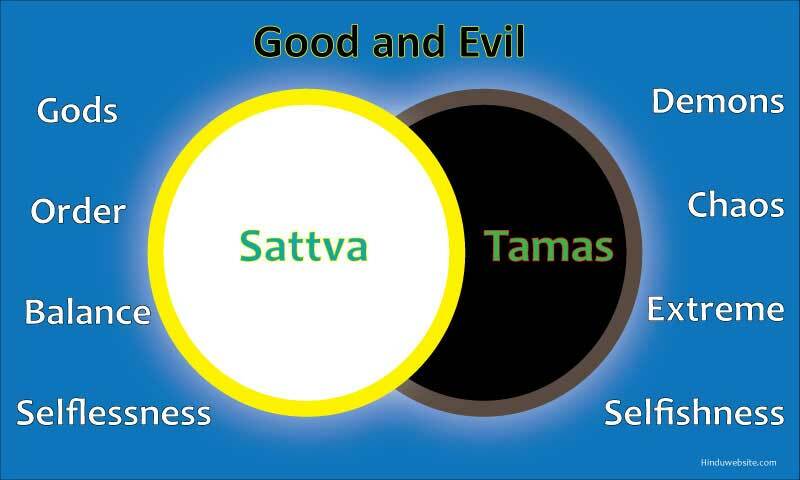 Hinduism clearly identifies the difference between good and evil, but its definition of both is different from what we usually understand about them. According to Hindu scripture good or divinity is represented by purity (sattva), light, balance, immortality, order, virtue and selflessness. Evil is represented by impurity (tamas), darkness, imbalance or extremity, chaos, sinful conduct, and selfishness. The former lead to liberation, peace, and happiness, while the latter lead to suffering, rebirth or even downfall into darker worlds. There is also a grey zone, the middle one, a combination of good and evil, represented by smoke, rebirth, mortality, and suffering, which is the nature of existence upon earth. According to the Puranas, existence is a constant struggle between order and chaos. The demons try to disturb the divine order while the gods strive to uphold it. Therefore, the divinities represent good and the demons evil. The same struggle happens in the body of each being upon earth. The divinities are present in the body also since the body is a replica of the macrocosm (Viraj), which is also defined in the scriptures as Death and Time. Now, if the organs in the body are used for selfish purposes, it is evil. If they are used to perform sacrificial actions, both ritually and spiritually, it is good. Karma accrues from both good and evil actions, but those actions which are performed as an offering to God with sacrificial attitude without desires, do not bind the beings. According the Upanishads, all the organs in the body are susceptible to evil, except breath. According to a story presented in the Brihadaranyaka Upanishad, the gods tried to seek protection from various organs in the body. But the demons saw the danger and pierced them with evil. But then they tried to pierce breath, they were destroyed. Thus breath is a purifier, preserver and controller. All the organs in the body are propelled by desires, but one has to breath involuntarily. Breath is not under the control of our will or intention where as all the organs are susceptible to them. Hence breath is superior and invulnerable to desires and evil intentions.